Water baptism is an important step to take in your Spiritual Life. There is no one greater than Jesus Christ Himself who is delighted when one of His followers publicly declares their faith in the Lordship of Christ through baptism. Water baptism is vital because Jesus commanded it. 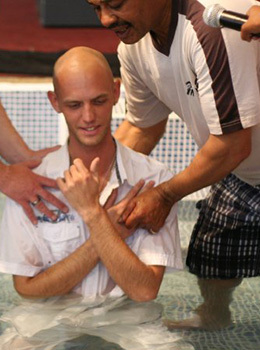 Water baptism signifies burial and a new life. Water baptism publicly declares our allegiance to Christ. Water baptism indicates the seriousness of our commitment. It is the visible sign that seals the spiritual commitment. Water baptism is an act of obedience to our Saviour and Lord. There is also the opportunity and benefit of making a real statement to others by way of your testimony being witnessed by others. Baptism provides a great opportunity to share your faith to others. Not only is the occasion an opportunity to invite family members to Church your friends might surprise you also by taking up on an invitation to attend church to see you being baptised.